In the last 50 or so years, observers have noted with concern declining rates of voter turnout in many democracies. There has also been a perceived narrowing of ideological diversity in many party systems, with, in particular, many parties on the left moving towards the centre. However, extant literature on turnout and party systems has realized only mixed and often contrary results. By replacing poorly performing aggregate measures of polarization and number of parties with a novel measure of left party strength, a consistent association with turnout is uncovered, alongside clearer conceptualization of how ideological diversity affects turnout. Findings show that measures of party systems that capture the ideological strength and position of left parties have a significant and substantial positive association with voter turnout outperforming more commonly used aggregate measures of party systems. Turnout (registered): Valid voter turnout: percentage of registered voters casting valid votes in national legislative elections. Source: International Institute for Democracy and Electoral Assistance (IDEA). Turnout (population): Valid voter turnout: percentage of eligible population casting valid votes in national legislative elections. Source: International Institute for Democracy and Electoral Assistance (IDEA) http://www.idea.int/. Polarization: Standard deviation of the ideology score of parties that gain over 1% of the vote in national legislative elections weighted by party vote share. Source: Comparative Manifesto Project. Left party strength: Ideology score of the party furthest to the left (weighted by party size) which gains over 1% of the vote in national legislative elections. Source: Comparative Manifesto Project. Right party strength: Ideology score of the party furthest to the right (weighted by party size) which gains over 1% of the vote in national legislative elections. Source: Comparative Manifesto Project. Parties: The effective number of parties at the electoral level. Source: Gallagher, 2014 (www.tcd.ie/Political_Science/staff/michael_gallagher/ElSystems/index.php, accessed Jan 2015). Polarization: Standard deviation for all parties that receive at least one per cent of the votes in each national election, weighted by vote share. Source: Comparative Manifesto Project. Population: Estimated population size in millions. Source: The World Bank (www.worldbank.org). Proportional representation: A (0,1) dummy variable that takes the value of 1 if a country has list PR. Weekend voting: Elections held on Sunday (1), other day off the week (0). Source: Klaus Armingeon, Laura Knöpfel, David Weisstanner and Sarah Engler. 2014. Comparative Political Data Set I 1960–2012. Bern: Institute of Political Science, University of Berne. Founding: A country’s first democratic election (1), other (0). Source: International Institute for Democracy and Electoral Assistance (IDEA; www.idea.int/data-tools). Compulsory voting: Compulsory voting laws (1), other (0). Source: International Institute for Democracy and Electoral Assistance (IDEA; www.idea.int/data-tools). Unicameralism: A (0,1) dummy variable that takes the value of 1 if a country has a unicameral system. Closeness of the election: Difference between the vote shares of the two largest parties. Source: International Institute for Democracy and Electoral Assistance (IDEA; www.idea.int/data-tools). Abramowitz, A.I., and K.L. Saunders. 2005. Why Can’t We All Just Get Along? The Reality of a Polarized America’ The Forum 3 (issue 2, article1). http://www.bepress.com/forum. Gallagher, 2014. www.tcd.ie/Political_Science/staff/michael_gallagher/ElSystems/index.php. Accessed Jan 2015. 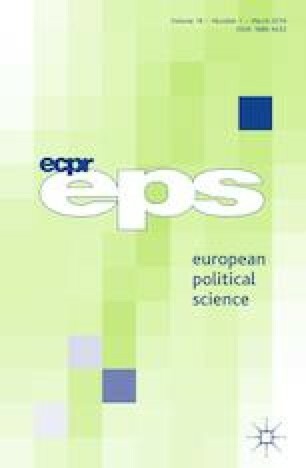 The Comparative Study of Electoral Systems (www.cses.org). CSES Module 4 Second Advance Release [dataset]. March 20, 2015 Version. https://doi.org/10.7804/cses.module4.2015-03-20.